Market Analysis Using Esri Business Analyst—This course is for market analysts and other professionals with limited GIS experience who want to unleash the power of location analytics to increase understanding of their customers and competitors and uncover market opportunities. You will learn best practices to work with the Esri Business Analyst system to visualize and analyze demographic, consumer, and business data and effectively share your analysis results with decision makers. Practicing Geodesign Using ArcGIS—By providing a framework and robust tools to create and quickly evaluate design alternatives, geodesign supports sustainable planning that meets the needs of local, regional, and global communities today and in the future. This course teaches planning and design workflows to iteratively model, visualize, and assess the impact of individual decisions on an overall design plan. You will learn a GIS-driven workflow to help guide a design project from start to finish. ArcGIS 10.2 for Desktop: Quick Start for ArcGIS 9.x Users—This full-day workshop is for experienced ArcGIS Desktop 9.x users who are transitioning to ArcGIS 10.2. You will learn about interface enhancements and simpler workflows designed to make your GIS mapping, editing, and analysis tasks faster and easier. New capabilities for imagery and 3D visualizations are also covered. You will also see how the integration of ArcGIS Online into the desktop environment makes accessing and sharing GIS data, maps, and analysis results a seamless part of your GIS workflow. Find more information about these offerings and view the complete catalog of Esri training options at esri.com/coursecatalog. At each ArcGIS release, the Esri technical certification team coordinates an extensive review of all existing exams to evaluate the impacts of the release on exam content. The four technical certification exams below have been updated for ArcGIS 10.2, and the 10.2 exams will be released publicly in the coming months. As shown in the table below, four certification exams were minimally impacted by changes introduced at version 10.2. Because the knowledge and skills measured by the 10.1 exams remain relevant at version 10.2, these certifications will not have a version 10.2 exam. 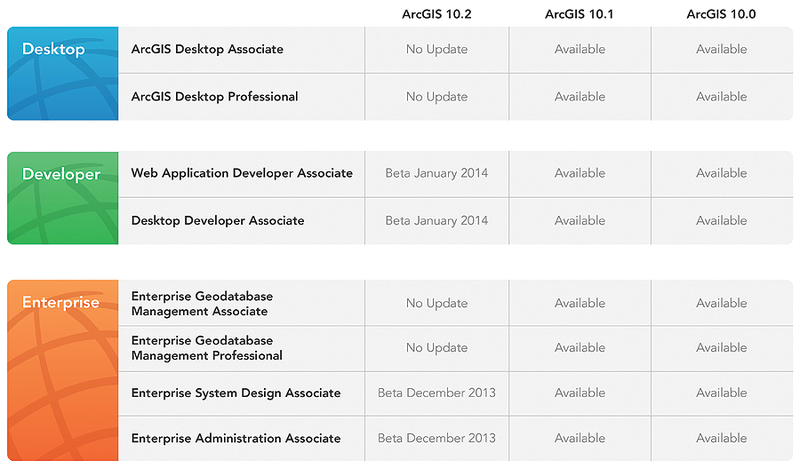 Individuals who are using ArcGIS 10.2 and would like to become certified in ArcGIS Desktop or Enterprise Geodatabase Management should take the version 10.1 exam. For detailed information about the Esri Technical Certification Program and exams, visit esri.com/certification.